National September 11th Memorial and Museum. 9/11 Environmental Action and Manhattan Borough President Gale Brewer are co-sponsoring an important 9/11 health benefits-related Town Hall on the evening of December 6th, 2017, in the MBP's office at 1 Centre Street. the new Special Master of the September 11th Victim Compensation Fund, Rupa Bhattacharyya. Space is limited, so it's important to RSVP now if you plan to attend. You may be eligible to apply for 9/11 health care or compensation. Find out more. A new book by one of our members: "Charlie K"
"It's an autobiography about the number of times and ways I went 'knocking on Heaven's door' since I was 5 years old. I also talk about how my life has changed having been there on '9/11' where I've been experiencing these unbelievable ''surprising coincidences' that have been occurring in my life..."
For many years, the World Trade Center Survivors' Network has consulted with the National September 11 Memorial & Museum on the development of an on-line Registry for survivors. We always felt that such a registry was essential to expanding the historical record and helping to build a larger on-line community. You can access the registries on the web site: 9/11 Memorial | Registries. We urge you to explore the Registries and help build their content. The Registries are a great tool to document your experiences and give access to a new on-line community. For more information, please refer to the Registries FAQ page: Registries FAQ page. You can also email questions by clicking the "Contact Us" button on the site's About page: Registries About page. and asks members to join the January 2014 inaugural class. Applications and additional information are available on the Museum website, 9/11 Memorial Museum Volunteer Page. after the recent opening of WTC West Corridor — the new transit hub area located under 1 World Trade Center. Our CFO Scott Kestenbaum shows Survivors’ support by attending the Mayor's Office for People with Disabilities ADA Sapolin Awards. 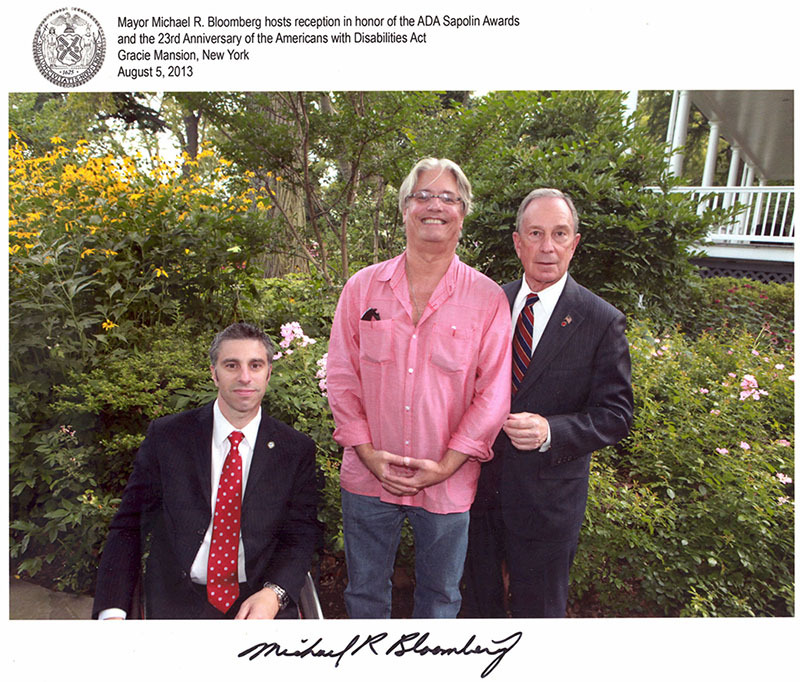 The awards are presented annually to New York organizations dedicated to helping people with disabilities. Although the Victim Compensation Fund deadline has passed, the World Trade Center Health Program established by the James Zadroga 9/11 Bill in 2010 is still available. This program provides medical and mental health care to Responders and Survivor affected by the WTC disaster at no out-of-pocket cost. Survivors are defined as those who lived, worked or went to school or daycare south of Houston Street or in Brooklyn within 1.5 miles of the WTC site. Survivors still living in and around NYC are treated at the WTC Environmental Health Centers located in Bellevue, Gouverneur, and Elmhurst Hospitals. Those living outside of the NYC area have access to a nationwide network of providers. See our web page, World Trade Center Health Programs, for a list of links and applications. As survivors we feel a responsibility to bear witness. We will always remember those who are gone. The World Trade Center Survivors' Network (WTCSN) is the only organization founded by survivors to serve those directly affected by the attacks on September 11, 2001. Our mission is to support and represent the interests of the survivors of September 11 and ensure that we will always remember. Survivors are those who were present at the attacks of September 11, 2001, worked or lived nearby, and the rescue and recovery workers, uniformed services personnel and volunteers present on the day of the attacks and the rescue and recovery efforts in the months afterwards. Many survivors feel a mutual responsibility to share our historic legacy with others. The WTCSN provides survivors with opportunities to bear witness to the events of the day as well as to meet other survivors. We work to provide opportunities for survivors to educate the public and add to the historic record -- thereby, ensuring that as a society we will always remember. We have forged an association of survivors who inform, support and encourage each other. We represent survivors' interests and needs and make certain that their viewpoints are recognized. See the Research page for a list of links. Stairs or Lifts? - A Study of Human Factors associated with Lift/Elevator usage during Evacuations. Researchers from the Universities of Greenwich, Ulster and Liverpool have completed a three and a half year study into the evacuation of the twin towers. We thank all the universities and researchers involved for continuing this important research and ensuring that the lessons of September 11th can be used to save lives in the future. The World Trade Center Survivors' Network is partnering with the 9/11 Memorial Museum in a new social media project on Resiliency. We are asking members to share stories, videos, or photographs demonstrating resiliency after 9/11 on the Museum's new Google+ Resiliency Community page. Help inspire others through your experiences and lessons learned. Current Members: To update your contact info, enter your email address here. A gift from our friends in Oklahoma City, the Survivor Tree is planted in Living Grove Memorial Park, across from City Hall. A tree grown from a cutting of the Oklahoma City Survivor Tree was replanted in the Living Memorial Grove, located across the street from City Hall, next to five trees that were previously planted in the World Trade Center Plaza. Information, map, directions.